Monterra Village is set in an ideal location with close proximity to both downtown Fort Worth and the Alliance corridor. With a direct entrance to Interstate 35W, residents have easy access to work, shopping, dining and recreational destinations. In addition, North Tarrant Parkway provides easy access into Keller with additional shopping and dining options. The scenic habitat area along the Western side of Monterra Village provides a natural buffer, so residents enjoy the best of both worlds with direct transportation access as well as a quiet, peaceful home environment. Monterra Village is located in the City of Fort Worth and is part of the Keller Independent School District. The community is also part of Alliance Town Center and the larger 26,000-acre AllianceTexas development by Hillwood. A 26,000-acre master-planned, mixed-use development, AllianceTexas presents innovative new ways for residents to work, live, shop and play. The award-winning development provides a unique balance of environments, lifestyles and growth opportunities for people to thrive. 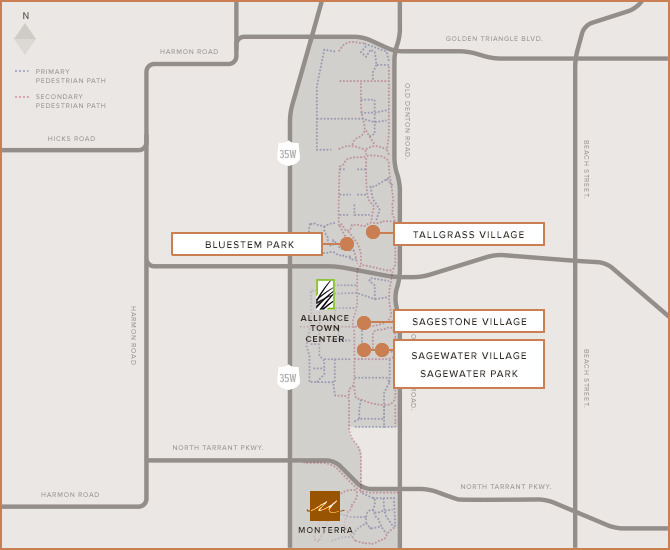 AllianceTexas, which includes Alliance Town Center, Monterra Village, SageStone Village & SageWater Village, is developed by Hillwood - A Perot Company.